We've decided to release a free book of spells for Sertorius called Book of the Archon. Part of why it will be free is we don't want to charge extra money for something certain groups consider essential to play (having to buy tons of supplements to keep up with a growing spell-list is a pain). This way, if you want more spells, just download the PDF. Book of the Archon will contain approximate 90 spells (the same number of spells found in the Sertorius Rule book). They are intended to create a campaign with a somewhat different feel from the core game. Therefore they are entirely optional, though spells can be brought piece by piece from Book of the Archon into a normal campaign of Sertorius. If things go well, we may release more spell books (for free) that each give the game a new atmosphere. 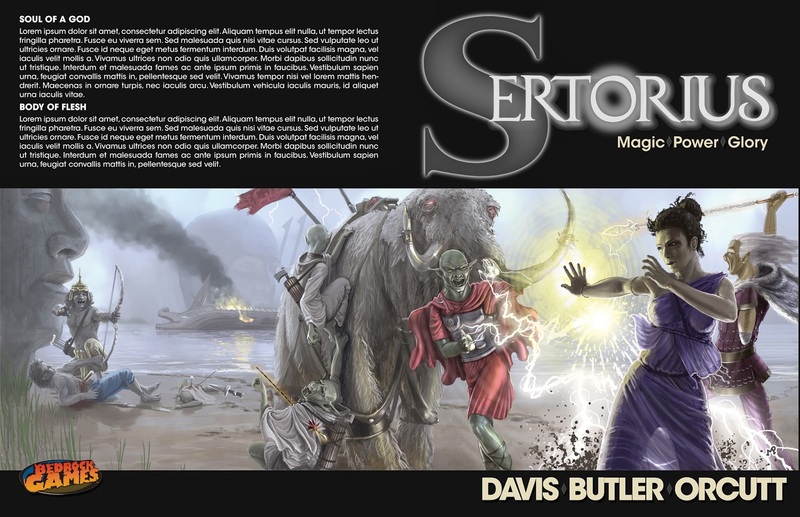 Here is the Sertorius cover art and an early version of the cover itself (we are still working on the finer details). If you click on the image, you can see it better. This is both the front and back of the book. The right side is what will appear on the front, while the left will appear on the back. An elven Sertori from Mandaru. Elves live a long time, many acquire scars or injuries, which is why his left arm is missing from the elbow down. A human Sertori. She is from an empire in its last days of glory, called Ronia. An orc Sertori. He is an official in the Caelum Republic, another empire, at the height of its power. Two kobold lictors. They are from the Caelum Republic as well and in the service of the orc. Two ogre warriors. The one firing the bow is a chieftain. The beast in the center is a Mammoth of Lorgo, a powerful creature from the realm of a god. Lorgo is the patron deity of Caelum. We are putting together the first module for Sertorius and it's going to be a free PDF. Our original goal was to include a short adventure in the rulebook, but we ran out of word space. So it made sense to write a complete module called Beneath the Banshee Tree and release for free in PDF. That way, anyone who buys Sertorius can just download Beneath the Banshee Tree and start playing. Currently, Beneath the Banshee Tree is being playtested (anyone who wants to participate can contact me at BedrockBrendan@gmail.com) and reviewed. It's a mystery adventure set in Talyr, a mountain city ruled by a troll who the locals worship. The module provides an overview of Talyr, several NPCs, a guide to introducing mysteries and managing clues, and a villain who evolves and grows over the course of the adventure. And once again, it will be completely free to download.